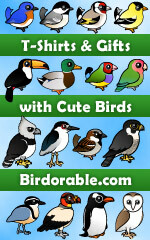 Home > Birding Apparel & Gifts > T-Shirts & Gift Ideas for Birders > Empids! This design refers to the group of flycatchers in the genus Empidonax. These birds are famous for being difficult to distinguish from each other and in many cases the only way to ID them is by their song. This design lists the five most common Empids living in the eastern part of the United States. Notice the way they are lined up here, the first letters spell out ALWAY. Another way to remember the names, even if you can't remember which is which! A cute, clever design for serious bird watchers.